Author: Beall, G., Throne, J. Hollow plastic parts range in size from small unit dose liquor bottles, doll heads and syringe bulbs to large gasoline tanks, pallets, and playground equipment. Designers and design engineers are often familiar with one way of making these parts but may not be aware of other methods that may offer greater design and performance flexibility. 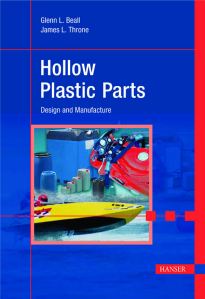 The book provides comprehensive design and manufacturing comparisons of three major methods—blow molding, rotational molding and twin-sheet thermoforming—as well as an overview of other methods used to produce hollow plastic parts. Not only will the seasoned designer be able to determine the advantages and limitations of specific technologies, but also the newcomer will be able to quickly select the best manufacturing method for any particular hollow product. This book provides comprehensive information on thermoforming principles and processes. It introduces students, as well as engineers and technicians, with experience in this field, to this area of plastics manufacturing. The reader will find extensive information on thermoforming-related subjects, from materials’ properties and processing data, to machines, tools, and trouble shooting.